Sydney Theatre Company presents ZEBRA by Ross Mueller at the Wharf 1, Hickson Road. The design for ZEBRA, a new play by Ross Mueller, has been created by David McKay whose background experience has been mainly in film production design. On stage is a meticulous re-creation of an American bar, THE BIG HOUSE, in some part of New York city. It is mostly convincing and the most amazing element is the window that looks out onto the outside entrance stairway to the bar, which has the most convincing winter outdoor, daylight lighting effect (Lighting Designer, Damien Cooper), aided with continuous, gently falling snow, that I have ever seen in the theatre. It became a source of distraction and comfort during the performance. Something to wonder , muse about. The performances by Bryan Brown, Colin Friels and Nadine Garner have the smooth self assurance of artists with a long pedigree in performance. After a nineteen year absence from the theatre, I last saw Mr Brown in RAINDANCERS by Karin Mainwaring, in this same theatre, Mr Brown has the ease and charisma necessary for Jimmy, a failed Australian entrepreneur, of West Coast real estate, come to meet his young finance's father, with what might be mixed motives fuelled by love and or greed. The role is not particularly demanding of Mr Brown's dramatic resources and he made it appear, comfortably, a relative walk in the park. Totally charming and believable. Colin Friels, who only occasionally, now, treads the boards,(more's the pity for us, the audience), last seen on stage, vividly memorable, both in VICTORY by Howard Barker (2004) and before, COPHENHAGEN by Michael Frayn, gives a beautifully nuanced investigation of Larry. Larry is an American business man of some judgement, comfortable and secure, having weathered the battering of the recent Global Financial Crisis (GFC), but who has not had the successful insights to maintain a personal life of equanimity. His daughter is estranged and divorce has been a feature of his other personal entanglements. He, Larry, is waiting to meet the prospective husband of his daughter / "mare". We have two old Zebra adults, Jimmy and Larry, circling each other, to create and/ or maintain their 'harem' with greeting and challenging rituals in THE BIG HOUSE bar. Mr Friels is an object lesson in acting expertise. The measured control of his instrument usage is rewarding to watch as he reveals his portrait of this fading alpha male. The vocal placement and mounting energy focus is thoroughly at the actor's service, complimented with physical details and clear purpose of objective. The energy of his life-force is in potential coils of excited restraint and is gradually revealed though the disrobing to fight club dress. The generous availability in the give and take with his fellow players, to create not only his own character, but, also the defining gestures for the other actors to define their tasks, is quite admirable and all young actors ought to catch Mr Friels' performance to see what it means to be part of an ensemble. Nadine Garner, playing the bar owner, bar keep, Robinson, whose craft I know, only, from her recent television work (City Homicide), is completely a match for the two powerhouse men she finds herself 'sparring' with. Robinson matches fearlessly the demands of her customers and may be the more consummate, of the three business 'men', for she ultimately finds a solution to her bankrupt business situation that she can accommodate without too much inconvenience to her conscience or life style. Feisty, intelligent and canny. A match, indeed, for Jimmy and Larry. The 'mare' has a possible assurance of a future. with one of these 'zebra' bucks. Lee Lewis, the director, then, has organised all of the elements available to her with expertise and artistic sensitivity. The Sound design by Paul Charlier, particularly the New York outside scape, convincing. The audio visual design by Shane Johnson also accurately grounding in effect to create the veracity of the world of the play, as is the costume work of Julie Lynch (what a pleasure to see Ms Lynch capture a wholly naturalistic world so convincingly). Why, then, does the experience of ZEBRA appear to be a relative waste of time and effort? 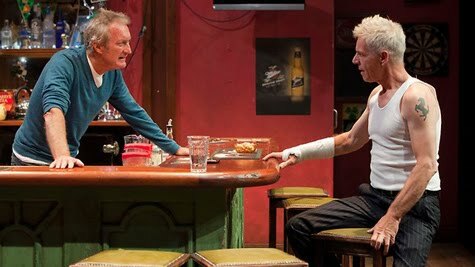 Ross Mueller's last play, CONCUSSION, seen at Wharf 2 in 2009, was in my estimation of the new Australian writing of that year, the best new Australian play I saw in Sydney. It had character, plot and sub-text . It had wit, subtlety and social relevance. It was confronting and stimulating. It was alarming and not only worth seeing (despite a flawed production) but worth reading. ZEBRA's text has the fast paced and wittily constructed language and speeches, peppered with one liners and clever 'musical' craftsmanship that CONCUSSION revels in. What it does not have is the depth of social observation and satirical skewering that the earlier play so cleverly incorporated. Or, if it does, this production does not have the edge or insight to deliver it to the audience. I have not read the play but I suspect that it is the writing that does not deliver in the same way as CONCUSSION. For, no matter how informative the program notes are of the global financial circumstances that occurred world wide, prior to where "ZEBRA begins at 10am on Sunday 11 January,2009",or, of the writer's personal note, telling us of the genesis of this idea for the play in a New York bar in January, 2009 while watching a football game, if it is not attached to the play at viewing, with clearer dramaturgical pointing , ZEBRA is simply a made for television soap / melodrama of no real import except the opportunity to watch three terrific actors in a more than competent production. Or, maybe the set design window created by Mr McKay,in abettance with Mr Cooper's lighting and Mr Charlier's sound scape distracted me from the subtlety of the writing ? Maybe, Mr Mueller was writing this play with an idea to an American production rather than an Australian one. His success there as writer so far would be tempting for him to consider that: a New York Dramatists Award in 2008 for CONCUSSION. Certainly, the American location, three characters and light weight, general issues of money bankruptcy, middle aged sexual rivalries between older alpha males around two young 'mares', against the visceral background of living in New York through the economic crisis around them, would lend itself to be, possibly, taken up there. But even the jaded New York or American audience may find the construct of this work just a trifle too old fashioned now. Although Zebra is well made, the formulation has the feel of the fustiness of the rule book of Playwrighting 101, 1950 or so, not 2011, and certainly not as the next play written by the writer of CONCUSSION who revealed such political and literary astuteness in his construct. Go, for everything else but the play. Disappointing.